A coming of age story following a college student Charlie, that must relive an uncomfortable memory when an old high school acquaintance shows up on his college campus unexpected. Charlie and his best friend Danny realize that their childhood acquaintance Mick's visit is turning into a longer stay than expected and he is strangely trying to assimilate into the college lifestyle. Charlie struggles to deal with why Mick has visited and if he could possibly change his ways since their childhood. 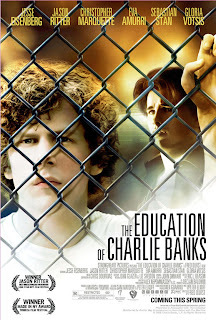 "The Education of Charlie Banks" is a wonderful coming of age tale that is rich in character development and carried by phenomenal performances by Jesse Eisenberg and Jason Ritter. The film that marks musician turned director Fred Durst's first directorial effort is a indie gem that unfortunately never received the theatrical release it deserved. Released in only 3 theaters for a mere two weeks, "The Education of Charlie Banks" was never given a real chance to succeed, but hopefully it will find a following now that it has been released on dvd. Fred Durst took Peter Elkoff's screenplay and created a moving event that is well worth a watch. The story told through Charlie's (Eisenberg) eyes, is simple in nature, but is told in a cat and mouse nature that leaves the viewer compelled as the story unfolds. The film transitions very nicely through Charlie's life starting in childhood moving into his first year in college. Durst does a powerful job of telling each act of the film while leaving some questions unanswered until the impressive finale. Where "The Education of Charlie Banks" excels is in it's relationship development between Charlie and Mick. Both Jesse Eisenberg and Jason Ritter are stunning throughout the film. Ritter stands out the most as Mick, while Eisenberg delivers his best performance since The Squid and the Whale. Ritter from his opening scene through the finale demands attention of his performance and he is utterly compelling as the tough guy from New York who is intrigued by the allure of college. Eisenberg once again drips of his subtle charm throughout the 100 minute film. He does a fabulous job of narrating the story and shares the screen remarkably with the rest of the cast. The rest of the character driven cast is also impressive. Sebastian Stan is solid as Leo, the college veteran who has a tendency for drinking and promiscuity. Chris Marquette (Fanboys) delivers another strong performance as Charlie's best friend and roommate. His performance leaves the viewer questioning why we haven't seen more from the talented young actor. Eva Amurri (Saved!) does a capable job as the love interest for both Charlie and Mick. The love triangle that develops between the three of them is compelling and makes for much of the natural storytelling in the coming of age tale. Overall "The Education of Charlie Banks" is a rich and natural story that is filled with an overall message of change and facing one's fears. Durst delivers a capable effort that leaves the viewer wanting to see more of what the musician turned director can do behind the camera. The performances carry the film and Esienberg's and Ritter's portrayals make the film a must see for 2009.